We provide acupuncture in a group setting. Patients remain fully clothed and are seated in zero gravity reclining chairs. We ask that you roll sleeves up to the elbow and pants up to the knees if possible. Normally we place needles below the elbows and knees, and in the head, but if you have clothing that makes this impractical, we can choose different points to accommodate whatever you’re wearing. If there are any parts of the body you do not want touched or needled, please let us know. Treatments normally last about 45 minutes. Some people feel like they’re ready to go sooner than that. If you’re one of those people, or if you need to be up by a certain time, just let us know and we’ll remove the needles when you request it. 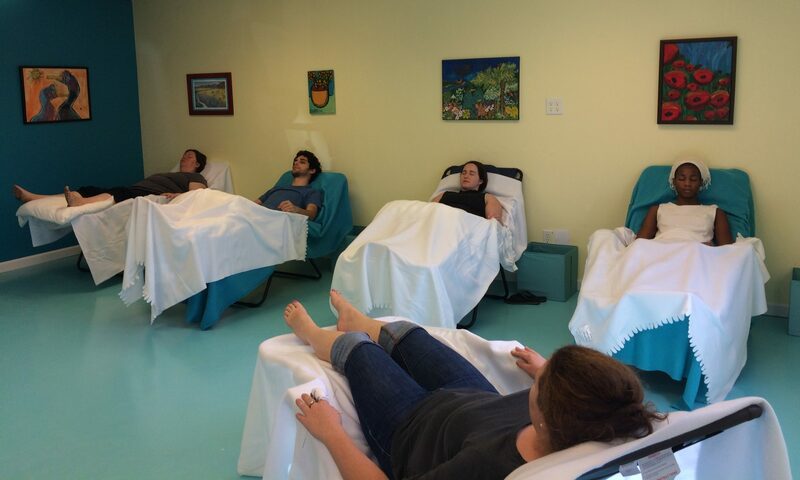 Many, but not all, people fall asleep during acupuncture treatments. This means sometimes people snore. If snoring bugs you, you might want to bring earplugs just in case. There is quiet music playing in the treatment room. If you prefer your own music, ocean sounds, spoken word poetry, or any other soundtrack to help you relax during treatment, you can bring headphones and listen to whatever you like from your mobile device. Please make sure that your headphones don’t broadcast sound — if other people can hear your music that won’t really work. We have blankets to keep you warm and cozy, but if you have a favorite blanket from home you’d like to bring, please do! Whatever makes you the most relaxed. Autistic folks: you can bring your weighted blankets, but we might need to prop them up a little above needles in your feet to keep the needles comfortable. We’re very happy to experiment with you on the best setup for your comfort.